The London College of Contemporary Arts (LCCA) entrusted us once again with the print work for their Undergraduate & Postgraduate Prospectus 2017/18. This involved printing on three different materials and was produced using two special colours on the cover plus four colour process throughout the booklet. The complex finishing methods included die-cutting 99 x 9mm diameter punched holes on the front cover, perfect binding and also included Index Cutting the inner 16pp text section to form short inset pages after the book was bound! The complexed finishing and binding took over two weeks to complete and we delivered 5000 copies. The result was a stunning prospectus which has been designed and produced beautifully. 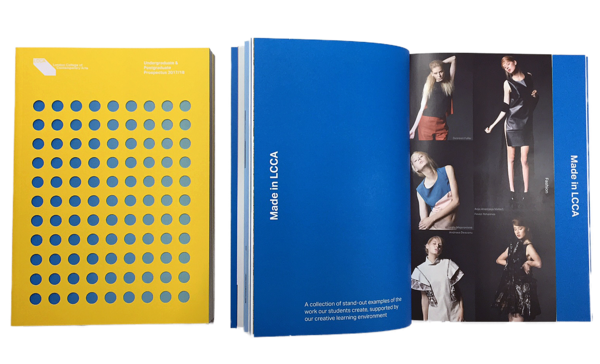 Once again we thank the LCCA and loved being involved in such a beautiful publication. "We are confident putting our most important print projects in the hands of the team at Aquatint, as they have produced excellent work for us for over a year now, and we’ve always been more than satisfied with the results. Especially with this project, the finishes are flawless, just as we had imagined it."